United States ThermoAmp Inc. was Incorporated in 1983 by Bill Bernardi (still President and CEO) after his former employer, EUS laid off all employees in 1982. Mr. Bernardi had been the pool heat pump product developement manager at EUS. A Penn State 1971 graduate - Bachelors Degree in Mechanical Engineering, he also attended University of Pittsburgh graduate school of Mechanical Engineering in the masters degree program and was a Licensed Professional Engineer in the State of Pennsylvania. United States ThermoAmp, Inc.'s original stockholders were Bill Bernardi and his two lab technicians at EUS Inc. John Kopec and Mike Tucciarone - Together the three of them made up the swimming pool heat pump product design team at EUS Inc.
EUS was focused on the high volume residential Electric Heat Pump Water Heater. They believed it could eventually replace the 30 million common (and cheap) electric resistance water heaters sold each year. Developing the pool heat pump was a low volume cash cow. Bill Bernardi saw it upside down - who would pay $1200 for a heat pump water heater when it could only save $150 a year in electricity. He told management that the pool heat pump was the real future because it inherently could save 80% of the energy required to heat a pool which is several hundred to over a thousand dollars a year on larger pools, especially where they are heated all year. After spending years developing a pool heat pump for EUS they ran out of money and laid off all office staff. 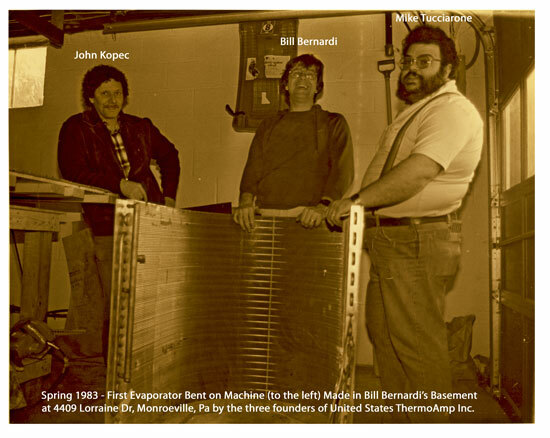 Bill Bernardi , Mike and John fabricated the first tooling which would be required to bend the large fragile aluminum finned tubing evaporator. They actually bent the first one in the basement as the 2nd snapshot captures them right after the event, standing just behind the white garage door in the picture above it. In addition, they needed molds to get production plastic cabinets, so they took 2 inch thick foot wide planks of solid cherry wood, glued them together with high temperature epoxy cement and with little more than a belt sander and a router, they fabricated three molds (one for the top, the backpanel and the basepan). Bill knew a vacuum-former in Pittsburgh, Kenson Plastics, who he had worked with while at EUS and took the molds to him asking that he pull a set of parts from them. With almost no modifications they worked. With the first cabinet parts and the evaporator formed, they then needed the water side heat exchanger, so they made a three wheel tube bending machine to coil cupronickel tubing. Back then all pool heaters used copper for their heat exchanger tubes and they hadn't yet discovered just how severe and how rapidly high chlorine pool water could corrode even cupronickel which they chose as an improvement over gas heaters. Now they turned to the fan motor and mounting. Bill designed a very low noise motor mount and they visited another vendor he knew in Cleveland to fabricate the mounts out of thick wire. From 1979 to 1983 Heat Siphon's founders were busy working at a small company in Monroeville, Pa called EUS Inc. designing and testing EUS's first swimming pool heat pump. They innovated the first round unit and the first vacuum formed plastic cabinet. They also designed the first spa heat pump, a small round 110 volt unit. Back then (1982) just before EUS laid off everyone at the Monroeville, Pa offices, they were working on a blue acrylic coating to prevent corrosion of the copper coils they were using in the EUS heat exchangers. EUS started back up in 1984 in Tennessee and continued to make pool heaters with literally NO CHANGES to those designs right up until the new owners decided to sell it. In 2003 - the Hayward pump company purchased EUS Inc. Initially they continued to use that blue coating, until 2008 when they adopted Heat Siphon's use of Titanium. To this day they still use the same cabinet designs developed by Heat Siphon's founders. 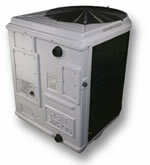 In 1986 - Air Energy Heat Pumps (founded by our first customer - a Miami pool builder named John Zakryk) copied Heat Siphon's cabinet and fan/grille design and began assembling a pool heat pump which was remarkably similar to Heat Siphon, in Pompano Beach, Florida. In 2001 - Kopec Industries (now defunct) was started by one of our founders, John Kopec's son Butch. In 2003 Jandy purchased Air Energy. In 2008 they switched from cupronickel to titanium. We are now in our 36th Year, still privately owned and still making HEAT SIPHON Swimming Pool Heaters in Latrobe, Pennsylvania and shipping them ALL OVER THE WORLD!
" . . STARTED" cont'd. Tooling would be required for the fan mounting parts, but they could not make it themselves and were low on working capital. So Bill talked the vendor into making the tooling and amortising it's cost over the first 1000 pieces to avoid the up front expense. With the first samples of these parts, they built the first Heat Siphon total cost, cash-$3500 Bill had saved and labor- months of evenings in the basement at 4409 Lorraine Drive. In the Fall of 1983 for $500/month they rented an old 2000 sq ft building in an industrial park Latrobe, PA (which became the current factory) to set up production. Eight years later Heat Siphon bought that entire park and the factory is still there today. 1992 - First and still the ONLY electrically isolated water-side Heat Exchanger. 2007 - First Coach Wireless Controller installed on Cranberry Twp Community Pool managed 12 Heat Siphons. 2010 - Shipped first Z700HP Heat Siphon model with Dual Heat Exchangers. 2010 - Shipped first Z250HP Digital Heat Siphon for above ground pools. 2013 - Equipped all Heat Siphons with new patent pending Electrically Isolated "Iso-Cap" Fitting on all Heat Exchangers. 2014 - New Analog TimerStat Plus models with easy digital upgrade and improved surge protection. 2014 - Developed new Z200HP and C200HP models for above ground pools and small inground pools. 2015 - Patent Pending Water Temperature Probe makes Heat Siphon MOST ACCUARATE in the world!! 2015 - Began SHIPPING new Z200HP above ground models. 2016 - US Patent 9,255,656 Granted for the Iso-Cap Fitting that insolates the water side heat exchanger from ground and the rest of the Heat Siphon. 2016 - US Patent 9,273,889 Granted for the Cool Lag Controller algorthm used by the Player to more efficienctly and cost effectively detect air temperature.